ISCO is highly experienced in meeting the needs of mine operators across a broad range of complete piping systems. This includes GIW pumps for the Aggregate market as well as HDPE piping. Our Mining Products Division custom designs and integrates pumps (centrifugal and submersible, split-case and vertical turbine) with HDPE piping for the transport of everything from clean water to slurry. The excellent abrasion and chemical resistance qualities of HDPE make it an ideal solution for collecting and handling extreme solids. Plus, when you contract with ISCO never have to worry about joints and leakage. We provide the fusion services, equipment and training you need to install and maintain the integrity of your pumps and pipes. When the system needs to be moved or modified, we offer an extraordinary inventory of fittings and ancillary items available from a single source for your convenience. It’s a total package that has made ISCO a world leader in fluid collection and transportation. 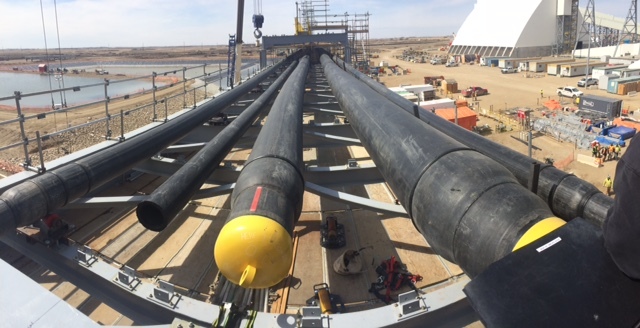 Extreme abrasives called for ISCO’s customized solution at Canadian potash mine. K+S Potash Canada (KSPC) recently opened a new greenfield potash mine in Bethune, Saskatchewan, CA with a projected production capacity of 2 million tons of potash. 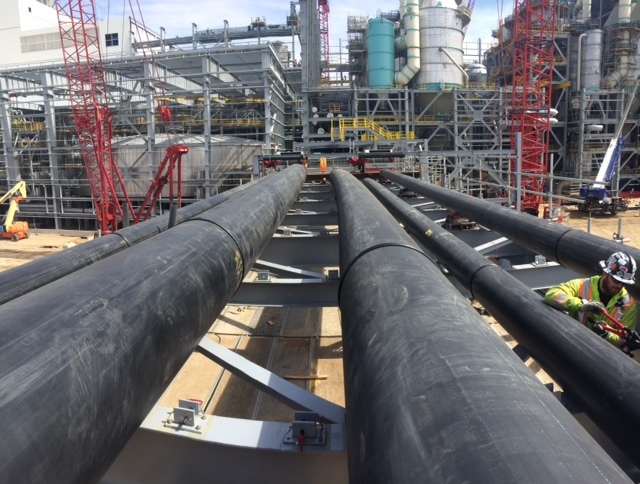 This site pumps and pipes highly abrasive materials including slurry and salt slurry as well as process water across miles of pristine territory. Wear resistance and the ability to design a custom solution led K+S to choose ISCO. The $4.1 billion-dollar Bethune mine is now fully operational, extracting potash crude salt using a solution-mining process where hot water is pumped down through ISCO piping to one well, it dissolves the minerals into a brine which is pushed to the surface, then transported to the drying facility through the ISCO-built system. It is processed into three different potassium chloride products for use in fertilizers and compacted for industrial applications. While this was a massive project, ISCO’s ability to provide on-site, customized solutions on a part-by-part basis at every single connection made a huge difference. "ISCO was able to provide not only the material to complete basic pipeline, but the customized fittings to make sure it met design requirements." Do you have a mine that has slurry transport challenges? Or are you currently bidding on mining project? We have the answers to the HDPE questions you have and more. E-mail us at and one of our mining experts will contact you promptly and personally.